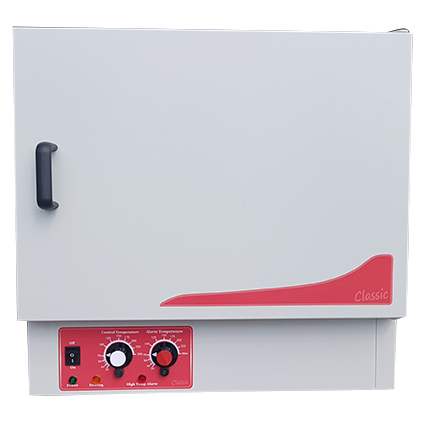 The GENLAB Classic Range of ovens offers a selection of highly efficient, reliable and cost effective units to suit most drying, warming and general laboratory applications. The simple to use thermostat system is good for teaching purposes and the units can be built up to meet individual requirements. The exterior is constructed from sheet steel finished in an easy clean powder coated paint. The interior chamber is made from mild steel coated with aluminium (CLAD) with a stainless steel (SS) chamber available as an option. Heated by Incoloy sheathed elements, positioned below the chamber floor for natural convection units and fitted around the fan on the back wall of the chamber for mechanical convection units. The control system comprises of a direct reading thermostat and overheat thermostat, both with calibrated scales and tamper proof locks. They also include a mains switch with indicator and heating and overheat indicators. 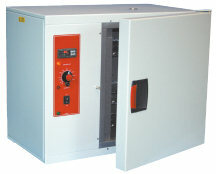 All units have CLAD interior with thermostatic control and overheat. E.g. 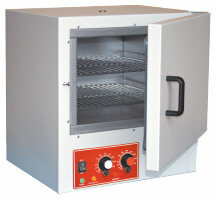 MINO/75 with stainless steel interior and fan circulation becomes MINO/75/SS/F. 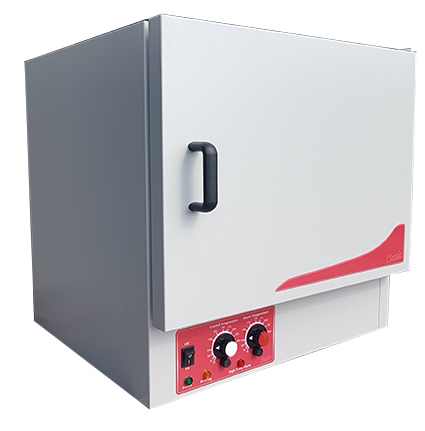 The Genlab range of Benchtop Ovens offers a range of highly efficient, reliable and cost effective ovens to suit most warming, drying and heat treatment processes. Available in a variety of sizes and designed with both side or base mounted displays to suit your exact needs. Featuring our latest touch screen control system which offers intuitive control and excellent accuracies designed for industrial and laboratory ovens. The exterior is constructed from sheet steel and finished in an easy clean powder coated paint. The interior chamber is made from mild steel coated with aluminium (CLAD), with a stainless steel (SS) chamber available as an option. They are fitted with fixed shelf runners and removable chrome plated wire grid shelves. Heated by Incoloy sheathed elements; positioned in the base of the oven on all natural convection ranges. Fan assisted ranges have elements in the rear on base mount designs and in the side on side mount designs. All units have CLAD interior with a touch screen interface as standard. 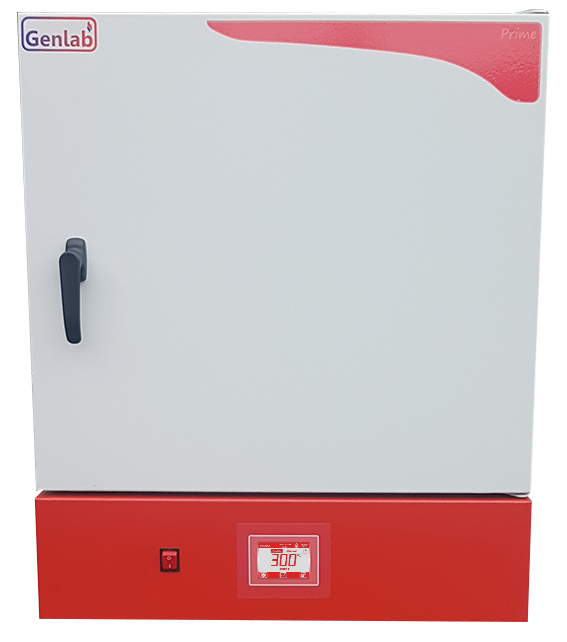 The GENLAB range of Prime Ovens are the flagship brand of Genlab Ovens. They are built to the highest standards and packed with many features and enhancements. As standard, the Prime range offers a heavy duty stainless steel interior, increased accuracies on our standard models and are quicker responding. 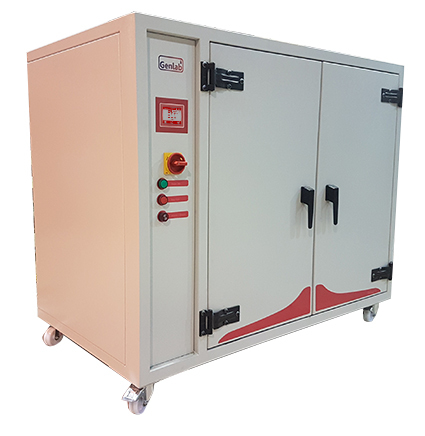 This range can offer increased load capability, multiple reinforced shelves and operate at 300 ºC continuously. It features our latest touch screen control system which offers intuitive control, designed for industrial and laboratory ovens. The interior chamber is made from stainless steel. The units are fitted with fixed shelf runners and removable chrome plated wire grid shelves. The units are heated by Incoloy sheathed elements positioned around the fan fitted at the back of the chamber. The control system comprises of a bespoke touch screen interface that offers both accurate temperature control and an integral overheat system by using 2 individual Pt100 sensors. Advanced features can be turned on and off to suit bespoke heating applications and tailored to customer preference. Oven trending is displayed for up to 48 hours and optional upgrades are available for alarm outputs. 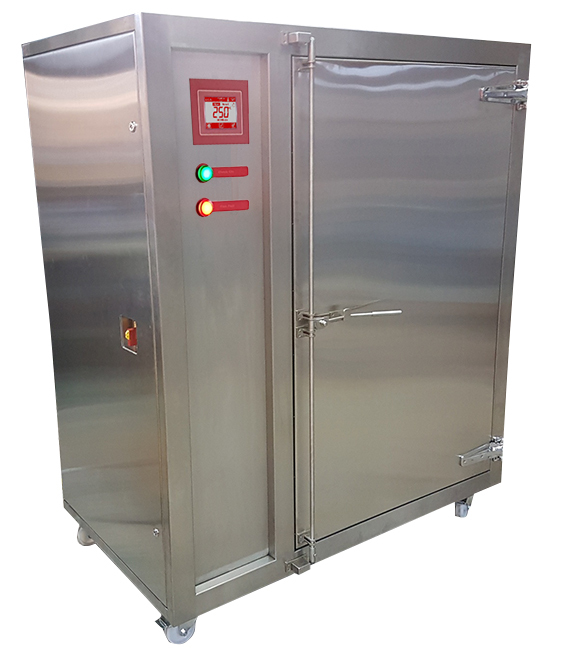 All units have a stainless steel interior, forced convection and a touch screen interface with all the timer features enabled as standard. Where options are required, simply add the option code to the original reference. This range of Prime XL Ovens are the flagship brand of Genlab Large Capacity Ovens. These are built to the highest standards and packed with features and enhancements. As standard, the Prime XL range offers heavy duty stainless steel interior, increased accuracies on our standard models and are quicker responding. 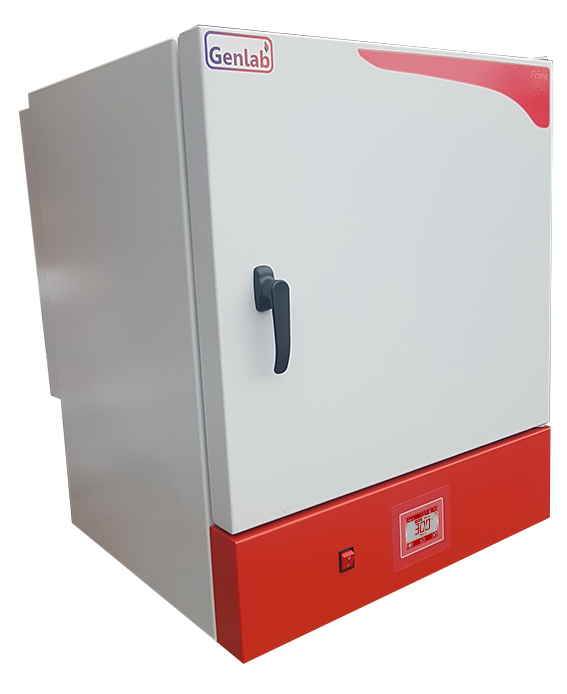 Built around a heavy duty panelled framework, we can offer increased load capabilities in the range, multiple reinforced shelves and operate at 300ºC continuously. They feature our latest touch screen control system which offer intuitive control designed for industrial ovens. The exterior is constructed around a structural frame and finished with powder coated clad panels covering heavy duty insulation. The interior chamber is made from 304 stainless steel and fitted with fixed shelf runners are removable chrome plated wire grid shelves. The vertical style units are fitted with single doors, the horizontal style units are fitted with twin doors. Heated by Incoloy sheathed elements positioned in the side fan duct for all units except the 250H and 350H, which have a base fan duct. The control system comprises of a bespoke touch screen interface that offers both accurate temperature control and integral overheat system by using 2 individual Pt100 sensors. Advance features can be turned on and off to suit bespoke heating applications and tailored to customer preference. Oven trending is displayed for up to 48 hours and optional upgrades are available for alarm outputs. The control panels are fitted on the side of each unit except the 250H and 350H, which are fitted in the base. All units have a stainless steel interior with a touch screen interface with all the timer features enabled as standard. Where options are required, simply add the option code to the original reference. 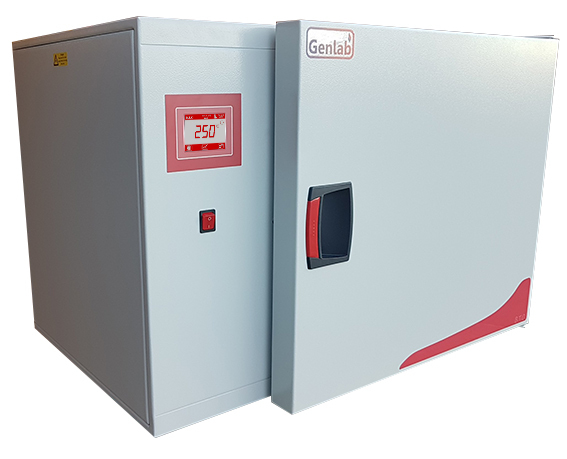 The GENLAB General Purpose Ovens offer a range of highly efficient, reliable, cost effective units to suit most drying, warming and general laboratory applications. The exterior is constructed from sheet steel finished in an easy clean powder coated paint. The interior chamber is made from mild steel coated with aluminium (CLAD) with a stainless steel chamber available as an option. Fitted with fixed shelf runners and removable chrome plated wire grid shelves. The top vent is fitted with a clip to hold a glass immersion thermometer. The vertical style units are fitted with the controls below the door, the horizontal style units with the controls fitted on the side. Heated by Incoloy sheathed elements; positioned below the chamber floor for natural convection units and fitted around the fan on the back or side wall of the chamber for mechanical convection units. 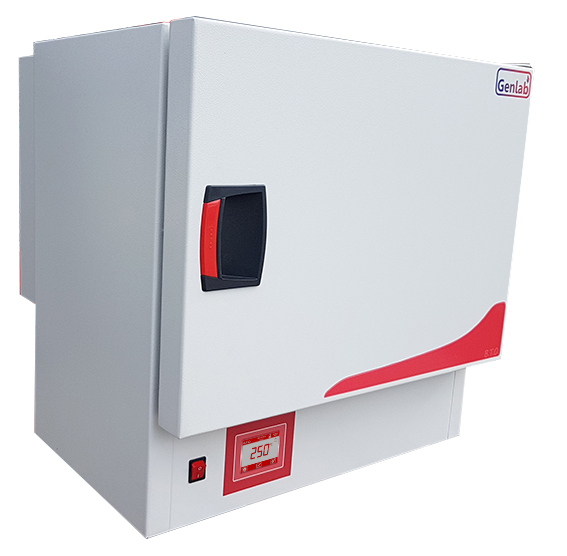 The 200 litre units have fan circulation as standard.